Listen to Rev. Majed El Shafie share his powerful story on the Vipp Jaswal Report (Fox News Radio). Rev. El Shafie was severely tortured and sentenced to death for his conversion to Christianity and bringing awareness to human rights violations related to religious persecution. Belonging to a very prominent legal and political family inEgypt, Rev. El Shafie had tried to work within the Egyptian system to reform the country’s human rights regime. Hear Rev. El Shafie's powerful story of victory in persecution here. Dear Friends and Partners, As the situation in Egypt continues to unfold, we would like to provide a follow-up to our earlier alert about the removal of President Morsi from office (in case you missed it, that alert is available on our website if you click here). The evening news continues to bring you stories of how hundreds of people have been killed over the past few days by Egyptian security forces firing live rounds against “peaceful demonstrators”. We cannot stress enough that we are against killing – we do not rejoice in the killing of any human being and certainly not innocent civilians. Moreover, we are not against Muslims – we are opposed to extremists. With this in mind, the news reports require some context and background. As we have said before, despite the common refrain that President Morsi was the first democratically elected president of Egypt, Morsi does not represent democracy. The electoral process was formally democratic but, not merely flawed, it lacked the fundamental substance of truly democratic elections. Yet even if Morsi was democratically elected, his actions once in office disqualify him from continuing in that office and demand immediate and forceful action on the part of the Egyptian military, which is the only institution capable of taking the necessary steps. Finally, seven weeks ago an estimated 30 million Egyptians flooded the streets or signed petitions in peaceful protests demanding the military fulfill its responsibility and remove Morsi. On the other hand, the demonstrations by the Muslim Brotherhood and other Morsi supporters have been far from peaceful. For several weeks the military leaders and international negotiators have tried to negotiate the peaceful removal of the protest camps. As we write this alert, the media are finally giving some attention to the casualties suffered by police after an incident in which 25 police were killed execution-style. But even before this incident, over 70 security personnel had been killed, from the very first minutes of the authorities’ action to remove the “peaceful” camps only a few days ago to just before the attack on police in the Sinai. The Muslim Brotherhood and other extremists have also taken the Christian community’s support for the army’s removal of Morsi as an excuse to justify unprecedented attacks on Christian targets. Over 40 churches and Christian institutions and countless homes and businesses have been burnt and destroyed in these past days. Three nuns were paraded in the streets like prisoners of war by a Muslim mob that burned their Christian school and attacks such as these are happening daily across Egypt. • Why does the international media ignore or downplay the estimated 30 million Egyptians who filled the streets of Egypt a few weeks ago, demonstrating peacefully and demanding that Morsi step down? In a country of a little over 80 million people, this is nothing short of true democracy in action but we hear very little about it. • The media focus on the large number of women and children among the hundreds of dead – but why don’t they ask why the Muslim Brotherhood would bring women and children to a demonstration which they know and fully intend will turn violent? • President Obama has cancelled joint military exercises with the Egyptian army to protest its actions. Will he stand for the will of the people, even if it requires the army to enforce it? Or will he and our other western leaders stand with an Islamist despot determined to make Egypt into an Islamic theocracy where non-Muslims have no place, simply because the man won an election? Not all Muslims involved in these demonstrations, or even everyone involved in the Muslim Brotherhood, are terrorists. However, the Muslim Brotherhood as an organization is a terrorist organization and its leadership is driving a terrorist agenda. There is no question that the Middle East will collapse if the Muslim Brotherhood wins in Egypt. As pro-Morsi demonstrations spread to Turkey and other Muslim countries and the West debates supporting the “democratically-elected” Morsi, the future of the Christians and peace in all of the Middle East hangs on the outcome of this battle. On Sunday Rev. El Shafie spoke at a rally organized by the Egyptian-Canadian community in Toronto. We would like to thank Ghada Melek, one of the organizers, who stressed that the Muslim Brotherhood’s battle “is not an attack on Christianity, but rather an attack on the Egyptian society as a whole”. Rev. El Shafie has also been interviewed by Canada’s SunTV several times about the situation in Egypt. You can watch some of his interviews and hear more about these issues by clicking these links for The Arena with Michael Coren and The Source with Ezra Levant. Finally, the Christians in Egypt desperately need medical supplies and we are trying to help meet this need –please help us send medical supplies to Egyptian Christians by sending your donation today. Please see below for donation information. • that democracy, human rights, and religious freedom would win the day over all forms of tyranny and intolerance in Egypt, and that the military and interim leaders would be guided by the best interests of all the Egyptian people and succeed in defeating religious extremism. • help us provide medical supplies and other humanitarian aid for Egyptian Christians by sending your donation today. Dear Friends and Partners, You have seen much in the news once again these past days about the situation in Egypt. As a result, we would like to take this opportunity to share with you the heart of the Egyptian people because much of the western news coverage is avoiding the real issues. The press casually refers to the military’s removal of President Morsi as a “coup” while many governments are trying to avoid the term, all the while finding ways to express support for the ousted president in the name of “democracy”. Yet unlike a typical military coup where an army acts on its own agenda, this action by the Egyptian army was taken in fulfillment of the will of the people and deserves our support. Mohammed Morsi was elected one year ago in elections that the press praised as Egypt’s first-ever “free and fair” elections. We did not believe these elections were free and fair then and we do not believe so now. Morsi and his Muslim Brotherhood supporters used threats and other undemocratic methods to get the Egyptian people to vote for him, and in some areas they actually prevented Christians from voting. But his election is really a side issue – the critical point is that even if Morsi had been elected in truly free, democratic elections, he has since lost his legitimacy and the mandate of the people. The people of Egypt, through demonstrations and petitions backed by millions of citizens, have demanded the removal of Morsi and his Muslim Brotherhood allies because they have turned their backs on the people. Together they have been quietly busy for the last year taking measures to transform Egypt into an Islamist state and seizing unlimited power for the president in a show of authoritarianism at least equal to anything President Mubarak ever attempted. All this time, they have ignored the country’s economy and allowed – even encouraged – attacks on minorities, particularly the large Coptic community, to increase with impunity. All this time the international community and the West have ignored these anti-democratic moves, but the Egyptian people have noticed and their quiet protests have grown, culminating in the mass demonstrations of the last two weeks. In the result, the pope of the Coptic Church and others, including the leadership of the influential Muslim al-Azhar university, have openly supported the army’s actions, leading to cries for violence from the Muslim Brotherhood. Most Egyptians – Muslim, Christian, or others – want peace. They want jobs and education for their children and a role in shaping their future and the country they love. 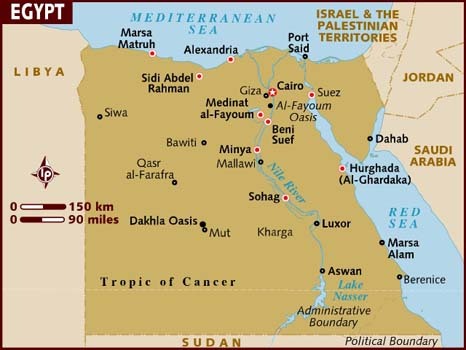 Unfortunately, however, there is a large portion of the population, represented by the Muslim Brotherhood and even more radical groups, who believe that the only future for Egypt lies in imposing their restrictive and intolerant brand of Islam on all Egyptians, using whatever means necessary. Just to drive home their point, since Morsi’s removal a priest and a number of other Christians have been murdered and Christian homes, businesses, and churches have been attacked and burned in four major cities to date. OFWI is greatly concerned over the increasing violence and open calls by the Muslim Brotherhood for attacks against Christians. The international community that supported the people of Egypt two years ago when they rose up against President Mubarak must not now be silent when those same people demand the removal of his successor who cares even less for democracy and his people. We must speak out and support the people of Egypt and help them work toward truly free and fair elections as soon as possible. At the same time, we must never forget that democracy is not an end in itself or democracy will become the new tyranny. As we and many others have repeatedly pointed out, even Hitler came to power through truly free and fair elections. Rather, democracy is simply a tool whose purpose is to enable us – all of us – to live peaceful and quiet lives in the pursuit of happiness or godliness or holiness, according to our choices. True democracy is not exercised on election day once every four or five years; true Democracy proves itself as it is lived out every single day between elections. In this, last year’s Egyptian elections have failed. Let us stand up for Democracy and let us stand with the Egyptian people. • that democracy, human rights, and religious freedom would win the day over all forms of tyranny and intolerance in Egypt, and that the military and interim leaders would be guided by the best interests of all the Egyptian people and not be sidetracked by the taste of power as they move forward on the road to democracy and the defeat of religious extremism. • to the ambassador of Egypt in your country, expressing your support for the people of Egypt and for the army’s actions in supporting the principles of true democracy; ask them to ensure protection for minorities in light of the threats from the Muslim Brotherhood and other Islamic extremists and don’t forget to inform them that you will be watching with great interest the progress of their country as soon as possible toward truly free and fair elections guided by the principles of democracy and human rights. Dear Friends and Partners,In an unprecedented act of officially-sanctioned repression, Egyptian security forces opened fire on Coptic Christian demonstrators in Cairo late last night, leaving at least 26 dead by the official count (some sources indicate the number is actually much higher) and hundreds injured. Thousands of Christians had gathered in the Shubra district of northern Cairo to stage a peaceful sit-in at the state television building to protest the interim government's lack of response to a string of anti-Christian attacks in recent months. The violence erupted when bands of armed young men began attacking the Christians. After initially standing by without taking any action to protect the Christian demonstrators, the Egyptian security forces themselves then engaged the demonstrators directly with lethal force. Security forces fired indiscriminately into the crowd with live ammunition and drove armoured vehicles and tanks into the crowd, ruthlessly crushing any demonstrators in their path. While some news reports in the international media have made reference to the involvement of armed gangs, they have tended to gloss over their role, leaving the impression that the Christian demonstrators are responsible for initiating the violence. However, despite media reports implying that the Christians attacked security forces with Molotov cocktails and torched military vehicles, our sources on the scene confirm that these actions were, in fact, carried out by government-sanctioned gangs whose aim was both to escalate the situation in order to justify military intervention and to pin the outbreak of violence on the Christian demonstrators. Although some of the demonstrators did respond in self-defence to the brutal tactics of the security forces, mostly by throwing available objects such as sticks and stones, this was an unarmed crowd of protesters staging a peaceful demonstration with no plan for a violent confrontation with security forces. The Christian community in Egypt, which makes up approximately 10% the population, has been under increasing pressure from ultra-conservative Islamic forces whose influence has grown in the power-vacuum left by the demise of the Mubarak regime earlier this year. The latest attack which directly inspired yesterday's demonstration took place on September 30, 2011, when a mob of over 3,000 hard-line Muslim extremists burned down the Mar Gerges Church in the Aswan province village of Elmarenab, along with several nearby Christian homes and businesses. The Elmarenab attack was the culmination of weeks of harassment by Islamist groups aimed at halting ongoing renovations to the church and represents merely the latest incident in an escalating series of attacks targeting the Christian minority since the spring. Egyptian Christians are in urgent need of our help. We cannot afford to sit idly by and leave our brothers and sisters to face this crisis alone. As we celebrate Thanksgiving and thank God for all the blessings we enjoy, including freedom to worship or not to worship in any way we choose, please stand up and make your voice heard on behalf of our brothers and sisters in Egypt who live and worship in daily apprehension and fear of violent reprisals. Please pray: That peace would prevail and that the Christians would be protected from further violence and reprisals from both government and unofficial forces. Pray that the Egyptian security forces would stop these attacks immediately and instead would do their job and begin protecting the Coptic Christians. For healing for the wounded and for comfort for the families of the dead during this time of tremendous trial and sorrow. Pray that the faith of the Christians would be strengthened so that they can stand strong in the face of this trial and serve as beacons of truth and love in this dark situation. For the Egyptian people, that their thirst for truth and freedom would be filled and that they would be able to find true peace and meaning in the Prince of Peace. Pray that this incident would not be used by extremists to justify an increase in violent repression against Christians and other religious minorities, but that Egypt would see a peaceful transition to a truly democratic government that will respect and protect the right of all Egyptians to live and worship freely in peace and security.